"Desperate Measures" Part 2 of 3. Script by J.M. DeMatteis. Pencils and Inks by Sal Buscema. Cover by Sal Buscema. The vindictive Vulture swoops into Aunt May's bedroom! However, Adrian Toomes doesn't want revenge, he wants forgiveness (for the death of Nathan Lubensky in Amazing Spider-Man 336). Does Aunt May give him forgiveness? No, she gives him a slap to the face! 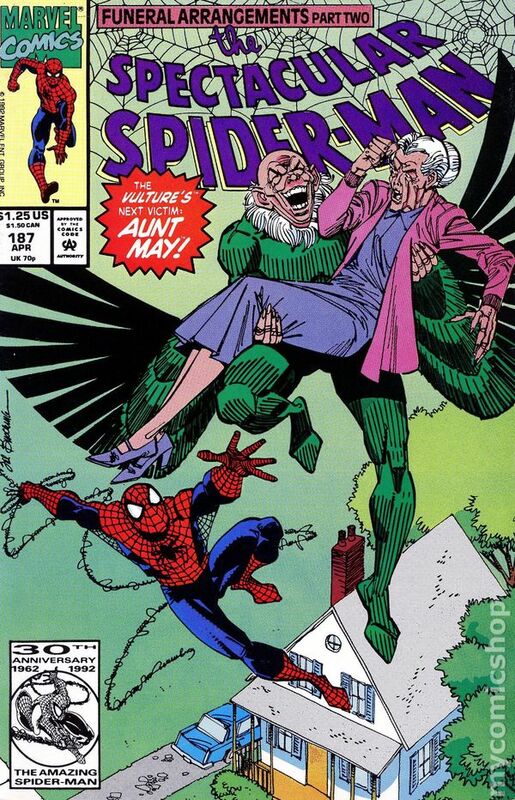 Wow, Aunt May vs. the Vulture? That sounds like a mismatch…until an enraged Peter Parker shows up! Setting the stage for another super showdown between the Vulture and the web-slinger next issue! 32 pages Cover price $1.25.